The following article incorporates research to be published in a forthcoming article, Active Learning in Accounting Classes with Technology and Communication Skills: A Two Semester Study of Student Perceptions (Gioiosa & Kinkela, in press). Active learning is a process that engages the student during the learning process while in the classroom (Prince, 2004) and active learning has been known to benefit students (Freeman et al., 2014; Prince, 2004; Tandogan & Orhan, 2007). In addition to students benefitting from active learning, students value active learning (Machemer & Crawford, 2007). Selecting the appropriate type of technology to incorporate in the accounting classroom to promote comfort with professional uses of technology and oral communication skills in a way that students value is important because students are stakeholders in their education. This study utilizes exercises in an accounting class that incorporate technology, and studies how technology can significantly impact student learning (Turney, Robinson, Lee, & Soutar, 2009), in an active learning environment. The exercises used in this study were created to promote two primary sets of skills valued by prospective employers: comfort with technology and oral communication skills (NACE, 2019). In 2013, the American Institute of Certified Public Accountants (AICPA) and the American Accounting Association (AAA) released the Pathways Commission report on Accounting Education – the Commission on Accounting Higher Education: Pathways to a Profession. In discussing curriculum (part four of the report) the mission of increasing use of technology was considered important. With students texting, streaming content that used to be watched on television, and using Snapchat and other apps, professors might expect students to already know how to use technology easily. However, students do not automatically have skills in technology that can help them present accounting results in a professional way, such as through PowerPoint or Excel. In addition, students need to learn about internet-based research sources in accounting. Students need to learn how to use the new technology and need to become comfortable with it as well (Dahlstrom, Walker, & Dziuban, 2013; Keengwe, 2007; Wallace & Clariana, 2005). The proper place to learn about the technology used in accounting is in the classroom, at every level of course, making it a habit, that is a trained way of learning. Does searching the internet, using Microsoft Word, and utilizing BlackBoard when learning new accounting terms help students become more comfortable with technology? Does sharing newly obtained information with fellow students help improve students’ communication skills? Nine accounting classes were included in this study in which students completed a survey in a Likert scale format. The survey (Gioiosa & Kinkela, 2019) measured students’ perceptions of various classroom exercises that were created to improve comfort with technology and oral communication skills. The total number of students registered in the classes surveyed was 194. Out of that population, 23 students were not present the time the survey was being distributed, bringing the possible total population to be surveyed to 171. Of the total, 168 students responded to the survey, which is a 98% response rate. Prior to the survey, approval from the Institutional Review Board (IRB) was obtained and the survey was administered according to IRB-approved requirements. During class, students participated in various exercises (Gioiosa & Kinkela, 2019), as noted below, that incorporated technology and oral communication as part of their normal coursework. Half of the students participated in exercise A (n = 84) and the other half participated in exercises B and C (n = 84). The instructor introduced new accounting terms in the classroom. After introducing the terms, a discussion took place with both instructor and students sharing their knowledge of the terms. The students were assigned homework that included obtaining real-life examples that described the term(s) they had just learned in class. The students were instructed to use technology (for example, a google search selecting websites of their choice) to obtain the information. Upon returning to class with the newly-found information, the exercise continued with the students sharing their newly-found information with the class. As the students shared the information, the instructor provided feedback that tied the information to the coursework, thereby reinforcing the new terms. After completing the in-class exercise, the students then created a summary that was uploaded onto BlackBoard either directly or via Microsoft Word. Students were taught a segment on financial ratios. Pairs of students selected a retail firm on which to perform comparative financial ratio analysis. In class students used Yahoo! Finance to select their company. Students prepared a financial ratio analysis Excel spreadsheet for nine ratios over two years. Students were required to define each ratio, calculate each ratio for two years, and provide results for each ratio and overall. Students presented the ratio analysis in class, and the class critiqued the spreadsheets and discussed retail industry trends. Students revised their projects and submitted the Excel spreadsheet for grading. Grades were based on the oral presentation and revised Excel spreadsheet. Students were assigned a PowerPoint presentation on one of the pre-Sarbanes Oxley accounting scandals. Groups of four were selected. Students were asked to present in class and include a short video clip not to exceed 30 seconds. Students were required to dress business casual. Students were graded on oral presentation and PowerPoint. The data was compiled in two ways and compared (Table 1). Overall, the results (Gioiosa & Kinela, in press) were positive and addressed the two research questions. The data was analyzed according to lower level courses (n = 63) and upper level courses (n = 105) (63 + 105 equals total population of 168). In addition, the data was evaluated based upon those students who took the survey for the first time (n = 122) and those who took the survey a second time (n = 46) (122 + 46 equals total population of 168). Source: Gioiosa & Kinkela, in press. For survey question number one, which asked students whether searching the internet for real-life examples helped them learn accounting terms, the results were consistent among lower level courses, upper level courses, and first-time responders: 94 – 95% of students either agreed or strongly agreed with the statement that the exercise helped them learn new terms. The response rate was 100% for all students who took the survey a second time. This provided a positive view of the exercises being completed for a second semester. Whereas this question captures student perceptions about course content, the intent is for students to utilize technology in the learning process and thereby improving their comfort with technology. The second survey question revealed a similar trend: 68% of lower and 67% of upper level courses, and 63% of first-time responders, either agreed or strongly agreed that searching the internet for real-life examples of accounting terms increased their comfort with technology as it relates to accounting. That response rate increased again for those students who took the survey a second time, with 80% agreeing or strongly agreeing. The trend recurs with the survey question that asked if sharing the newly obtained information in class improved students’ accounting knowledge. High percentages of lower (84%) and upper (90%) level courses and first-time responders (84%) either agreed or strongly agreed that searching the internet for real-life examples of accounting terms helped improve their comfort with technology as it relates to accounting. Those response rates are extremely positive and further increased to 98% when students were a second time. The trend also recurs with the survey question about whether using technology throughout the semester in this class prompted them to use technology in other classes. Although this question has the lowest rate of students agreeing or strongly agreeing, the results are still positive, with a majority of lower (58%) and upper (59%) level courses and first-time responders (56%) either agreeing or strongly agreeing. The response rate increased to 67% for those students who took the survey a second time. These trends support positive answers to both research questions. The first research question is trying to answer whether utilizing these class exercises help students become more comfortable with technology. The results are overall positive for lower level and upper level courses and for those students who took the survey for the first time. The conclusion that these exercises increased student comfort with technology derives even more support from the responding students who completed the exercises during a second semester. The second research question, which asked students if they felt their oral communication skills were improved by sharing newly obtained information in class, was likewise answered affirmatively. Between 71 and 75% of students agreed or strongly agreed when asked if sharing newly obtained information in class helped improve their communication skills. 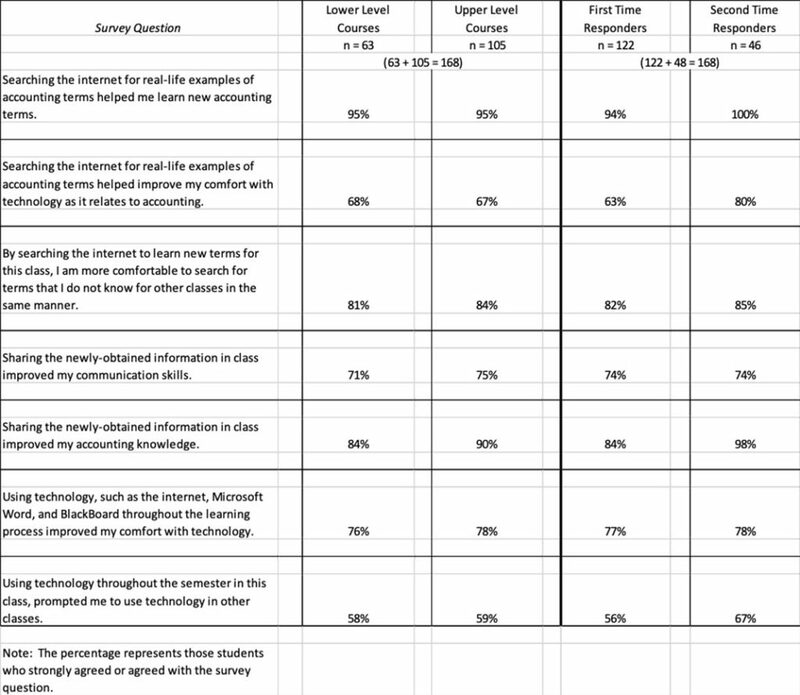 Since there appeared to be a significant difference in the responses to certain survey questions between those students who participated in the study once and those students who participated in the survey twice, an independent sample t-test was run for the data (Table 2). Levene’s Test for Equality of Variances was calculated noting whether equal variances were assumed or not assumed. The results (Gioiosa & Kinkela, in press) indicated a significant difference between means for the two groups for question 1 (searching the internet for real-life examples of accounting terms helped me learn new accounting terms) where t(166) = 2.942, p < .01; question 2 (searching the Internet for real-life examples of accounting terms helped improve my comfort with technology as it relates to accounting) where t(110.294) = 2.872, p < .01; and question 5 (sharing the newly obtained information in class improved my accounting knowledge) where t(166) = 2.012, p < .05. From this we may infer that the students who took part in the study twice support the support the use of the exercises studied in a significantly positive manner as compared to those who only participated in the study once. Table 2: Levene’s Test for Equality of Variances for Students Who Participated in the Study Once Versus Twice. The findings are consistent with the ECAR (Brooks, 2016) study, in which students agree that technology contributes to the successful completion of courses. It also supports the importance of incorporating technology into the curriculum. These findings were similar but much stronger than the Stepp-Greany (2002) study, where approximately 41% of the students agreed or strongly agreed they learned from internet activities. Researchers have noted active learning is valued and benefits students (Freeman et al., 2014; Prince, 2004; Tandogan & Orhan, 2007). Students are stakeholders in higher education, therefore their perceptions are relevant. As noted in this study, the exercises presented were valued by the students. Given that prospective employers are looking for candidates that are comfortable with technology and have good communication skills, it is important for students to feel that they are obtaining those skills throughout their education and in a way they value. The exercises incorporated in this study had a positive impact on the perceptions of students at both the undergraduate and graduate level. This was true whether they participated in the study once or twice, and was illustrated by students’ survey responses as well as by Levene’s Test for Equality of Variances. As a result, an instructor may consider incorporating the exercises evaluated into their classroom because they promote skills employers seek while teaching course content. Although the exercises were surveyed in accounting classes, the exercises can be applied to various types of classes. This notion was supported by the students who were involved in this research, who agreed and strongly agreed that they would use the techniques used in this study in other classes. The last survey question pertained to the impact on the future of students’ use in other classes of what was introduced to them in this study. The students’ positive responses supported the idea that they would utilize their new skillset in other classes. This behavior was observed in classwork completed after the introduction of these new learning techniques. The students’ positive responses increased by 11% after utilizing the exercises for two semesters. So if instructors are looking for ways that could assist students throughout their academic career, they might want to consider those techniques included in this study, because not only did students feel that they improved their comfort with technology and improved their communication skills via the use of these exercises, but they also felt these exercises would help them in other classes. Ballantine, J., & McCourt Larres, P. (2009). Accounting undergraduates’ perceptions of cooperative learning as a model for enhancing their interpersonal and communication skills to interface successfully with professional accountancy education and training. Accounting Education: An International Journal, 18(4-5), 387-402. Brooks, D.C. (2016). ECAR Study of Undergraduate Students and Information Technology, 2016. Research report. Louisville, CO: ECAR. Freeman, S., Eddy, S.L., McDonough, M., Smith, M.K., Okoroafor, N., Jordt, H., & Wenderoth, M.P. (2014). Active learning increases student performance in science, engineering, and mathematics. Proceedings of the National Academy of Sciences, 111(23), 8410-8415. Gioiosa, M.E., & Kinkela, K. (2019). Classroom exercises with technology and communication skills: Students’ perceptions. Journal of International Education in Business. Gioiosa, M.E., & Kinkela, K. (in press). Active learning in accounting classes with technology and communication skills: A two semester study of student perceptions. Journal of Education for Business. Keengwe, J. (2007). Faculty integration of technology into instruction and students’ perceptions of computer technology to improve student learning. Journal of Information Technology Education, 6(2007), 169-180. Lin, P., Krishnan, S., & Grace, D. (2013). The effect of experience on perceived communication skills: Comparisons between accounting professionals and students. In D. Feldmann & T.J. Rupert (Eds. ), Advances in Accounting Education: Teaching and Curriculum Innovations (Advances in Accounting Education, Volume 14) (pp. 131-152). Emerald Group Publishing. Machemer, P.L., & Crawford, P. (2007). Student perceptions of active learning in a large cross-disciplinary classroom. Active Learning in Higher Education, 8(1), 9-30. Siriwardane, H.P., & Durden, C.H. (2014). The communication skills of accountants: What we know and the gaps in our knowledge. Accounting Education, 23(2), 119-134. Stepp-Greany, J. (2002). Student perceptions on language learning in a technological environment: Implications for the new millennium. Language Learning & Technology, 6(1), 165-180. Tandogan, R.O., & Orhan, A. (2007). The effects of problem-based active learning in science education on students’ academic achievement, attitude and concept learning. Online Submission, 3(1), 71-81. Turney, C.S.M., Robinson, D., Lee, M., & Soutar, A. (2009). Using technology to direct learning in higher education: The way forward? Active Learning in Higher Education, 10(1), 71-83. Wallace, P., & Clariana, R.B. (2005). Perception versus reality—determining business students’ computer literacy skills and need for instruction in information concepts and technology. Journal of Information Technology Education, 4(2005), 141-151.